Located in an alleyway at 741 George Street in the Haymarket, this discrete little gem is being revitalised and pulling in discerning customers. Different masseuses every day from China, Taiwan and Japan. Directions Down the alleyway, first on the right through the glass doors about 2/3 down. Look for the purple signs. Parking 2 x Wilson Parking stations close by in Thomas Street. Public Transport Bus stop in both directions along George Street very close. Only 5 minute walk to Central Station, and 3 minutes to the light rail at Hay Street. 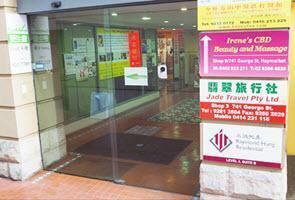 Speciality Full Body massage by skilled Chinese and Hong Kong masseuses. Different masseuses every day. Premises Modest premises but comfortable massage tables. 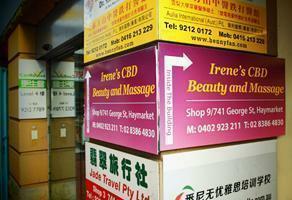 Looking for best in therapeutic and relaxation massage in Sydney CBD, Haymarket, Central Station, Chinatown? Call (02) 8386 4830 or 0402 923 211 Now!